The advent of phablets has had a dramatic impact on the smartphone market. Just 10 short years ago, people marveled at how big and beautiful the original iPhone’s 3.5-inch display was. These days, anything under 5 inches just seems crazy. The hottest smartphone trend in 2017 is bezel-less screens that allow practically the entire face of a smartphone to be occupied by the display, but smartphone screens can only grow so large before the phones no longer fit in our pockets. What you might not realize, however, is that any smartphone you already own can actually power a massive screen that measures up to 150 inches diagonally. Check out the Meyoung Portable Projector, a full HD projector that you’ll wonder how you ever lived without. Best of all, it’s on sale right now on Amazon for just $85! 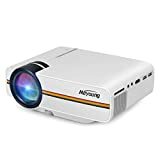 Meyoung portable projector perfect for connecting to any HDMI-enabled devices such as PCs, Laptops, Tablets, Blue-ray DVD player, Smartphones, Media players (Music, Pictures, Video, TXT), NOT recommend for PowerPoint Presentation. Meyoung home portable projector can display Music, Pictures, Videos from Smartphones (Notice: You need to purchase a HDMI ADAPTER separately). Supports Video Games in HD by the projector,such as PS4. Enjoying games on 50~130 inches BIG screen! High Price-performance Projector. Watching movies and football matches with super richer colors clear high quality images in completely DARK NIGHT, in courtyard, party, good gift for family and friends! Compatible with USB Flash Drive, Mobile HDD, SD Card to play Videos, Musics, Pictures etc. Comes with built-in loud speaker powerful amplifier.